70. 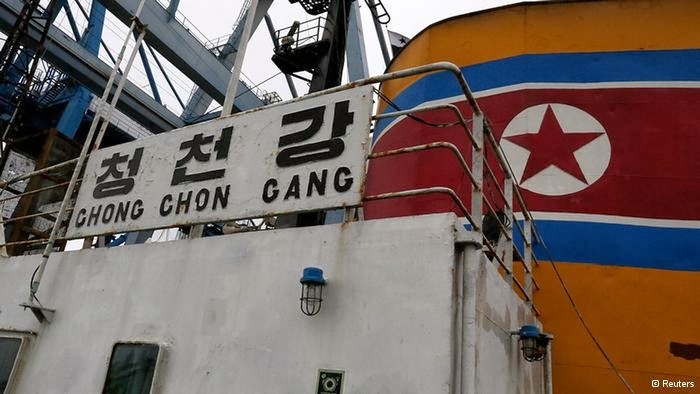 The Panel concluded in its incident report submitted to the Committee that both the shipment itself and the transaction between Cuba and the Democratic People’s Republic of Korea were sanctions violations. 74. 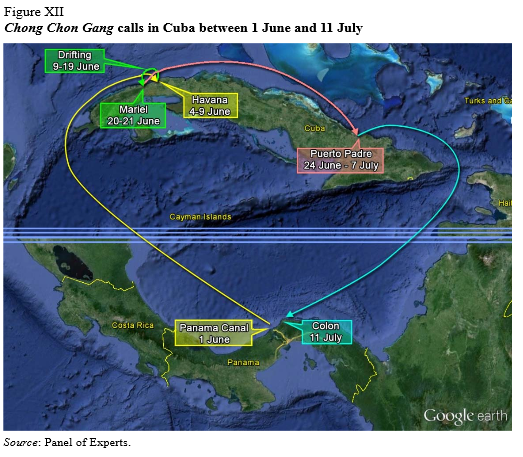 The Panel confirmed the route of the Chong Chon Gang was from Cuba to the Democratic People’s Republic of Korea. The voyage plan and other ship’s documents show that the vessel departed from the Democratic People’s Republic of Korea on 11 April, refuelled at the Russian port of Vostochny between 11 and 17 April before sailing to Havana via the Panama Canal. No records show the ship stopping at any countries other than Cuba between exiting the Panama Canal on 1 June and its return passage on 11 July. 76. On 16 July, the Ministry of Foreign Affairs of Cuba released a statement acknowledging ownership of the arms and related materiel and stating that they were being shipped to be repaired and returned. Cuba argued later to the Panel and in a report to the Committee that there was no “supply, sale or transfer” (as required by para. 8 (a) of resolution 1718 (2006)) since Cuba retained “ownership” of the cargo. Furthermore, it argued that “maintenance”, as set out in paragraph 8 (c) of resolution 1718, was distinct from “repair”, which Cuba claimed was the basis of its contract with the Democratic People’s Republic of Korea. 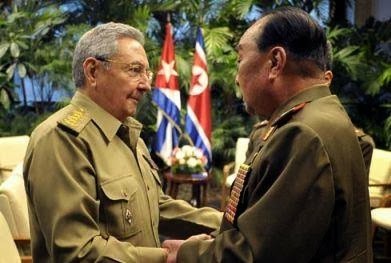 Cuba also invited the Panel to visit Havana for consultations with the Panel, when it stated that all arms and related materiel were being sent for “evaluation, diagnosis and repair”. The shipment was in violation of paragraphs 8 (a) (i) of resolution 1718 (2006) as modified by paragraph 10 of resolution 1874 (2009) prohibiting the direct or indirect supply, sale or transfer to the Democratic People’s Republic of Korea of all arms and related materiel. The transaction between the Democratic People’s Republic of Korea and Cuba was in violation of paragraph 8 (c) of resolution 1718 (2006) and paragraph 9 of resolution 1874 (2009), as clarified by paragraph 7 of resolution 2094 (2013), adopted to prevent the provision of technical training, advice, services or assistance related to the provision, manufacture, maintenance or use of such arms or materiel by the Democratic People’s Republic of Korea, its nationals or from its territory. 81. The concealment methods employed also flouted international regulations and safety practices and Canal regulations. The transportation of undeclared weapons and explosives in this manner posed a significant danger to all persons and facilities in proximity to the ship and should be a cause of concern among shippers, port authorities, the international maritime community and insurers. 87. The Panel sought to identify the consignor and consignee of the arms shipment. Documents found onboard show the consignor of the sugar to have been Cubazucar, and the consignee, Korea Central Marketing and Trading Corporation (see annexes XVI and XVII). No similar documents were found relating to the concealed cargo. In its consultations with the Panel, Cuba confirmed the parties involved in the sugar and said that the arms shipment was part of a governmental agreement. It declined, however, to give the Panel copies of these agreements, citing confidentiality clauses in the contracts. The Panel is not, therefore, able to identify the entities or individuals involved in these agreements. 1. A total of 25 standard shipping containers (16 forty-foot and 9 twenty-foot) and 6 trailers were found, for a total of about 240 tons of arms and related materiel.1 The Panel confirmed the presence of all the items declared by Cuba. The Panel did not find any items not mentioned in this list. Most of the consignment was of former Soviet military origin. 3. It included various components for the associated SA-2 and SA-3 radar systems (Fan Song and Low Blow radars – figure 1) such as the 6 trailers (i.e. the vans housing the system electronics, the operator stations or the power generators); antennas, bases, transmitters and tracking systems, as well as their supporting structures; electric generators; and other miscellaneous equipment (reels of cables, transport trailers, control and measurements instruments, etc.). The trailers were clearly labelled as belonging to Volga and Pechora systems on a loading check sheet in the captain’s possession. At the same time that the United States is warming relations with the Castro dictatorship and hinting at lifting remaining sanctions the Russians are now going to set up bases in Cuba, Venezuela, and Nicaragua. 4. The original paint scheme of the 6 trailers was matt green and this scheme was painted over in blue gloss paint. The original paint scheme can be seen on the inside of doors and doorframes (figure 2). 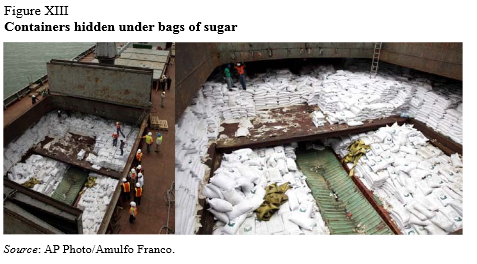 The damage caused by bags of sugar also reveals the original paint scheme on the roof of some of the trailers (figure 2). All other parts of the surface-to-air missiles systems found in the containers had not been repainted, but kept their original green or camouflage scheme. This suggests repainting was employed for concealment of military origin and nature, rather than protection against corrosion. 5. The shipment also contained a total of four SA-2 and two SA-3 launchers, which had been disassembled to fit into standard shipping containers (figure 3). 7.The shipment also contained a radar antenna, labelled “P-19”, and its associated supporting components. 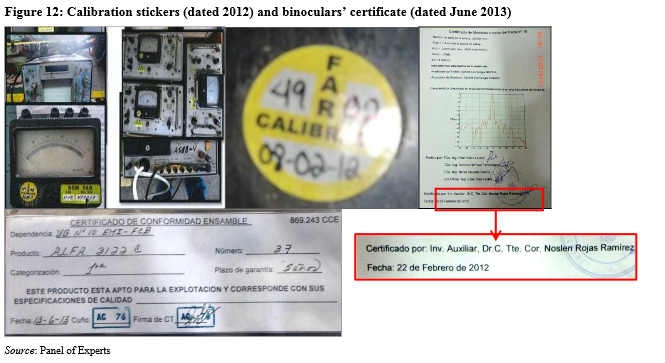 The instruction manual and certification report indicate that it is of Cuban manufacture (figure 5). 8. Two MiG-21 jet fighters were also found in the containers. Both had been disassembled and the various parts had been packed into several containers (figure 6). The tandem seating configuration and other features indicate that these are MiG-21UM advanced jet trainers. These two jet fighters were shipped along with 15 MiG-21 engines and afterburners (figure 6). 9. 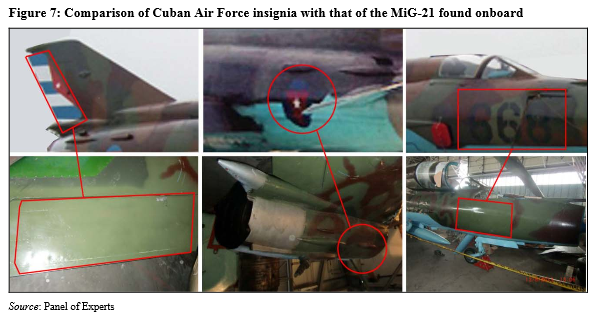 All identification markings and insignia of the Cuban Revolutionary Air Force had been removed from both MiG-21 aircraft; the Panel observed signs of overspray and scratch marks in places dedicated to original insignia (figure 7). 10. The shipment included 10 lots of shells casings (packed with samples of propelling charge but without primers) of various diameters (57 to 152 mm) for various purposes (fragmentation, high explosive, armour piercing and or tracer). Each lot contained between five and eight shell casings (figure 8). 12. Further, the shipment contained (figure 10): A single box of 7.62 mm cartridges (440 rounds); A machine tool for loading shotgun cartridges (12 gauge calibre ammunition); Another machine tool for manufacturing 5.56 mm cartridges. A tank track section; Various parts for Soviet AO-18 30 mm rotary cannons (firing pin, ejection window, bolt, rings, piston); One pair of night vision binoculars; A search light that can be fitted on helicopters, fixed wing aircraft or maritime vessels; Various gauges (ampere and power meters, tachometer, comptometer). 14. While the age of the items found in the shipment varied greatly, most appeared to have been well maintained. Records accompanying a great deal of the equipment indicated or certified the equipment functioned in accordance with specification or had been calibrated just prior to packing. 15.A large number of control and measurement instruments in the radar control stations carried stickers indicating that they were calibrated as recently as 2012 (figure 12). The night vision binoculars’ documents indicated that their conformity was certified less than one month before the shipment (figure 12). 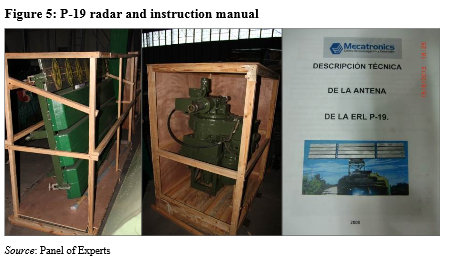 The P-19 radar antenna came with an instruction manual and a complete certification report dated February 2012 (figure 12). 34. On April 2012, the general cargo vessel O Un Chong Nyon Ho (IMO 8330815) operated by OMM, 11 sailed directly from Nampo to Cuba and back without any furt her calls in the region. After having stopped in Havana and Puerto Padre, the O Un Chong Nyon Ho drifted for several weeks off northern Cuba before returning for three weeks to Havana. Its Automatic Identification System was switched off (in violation of IMO requirements) during these three weeks, however, effectively preventing determination of further ports’ calls, as in the case of the Chong Chon Gang.. Taking North Korea off the list of state sponsors of terrorism was a mistake. 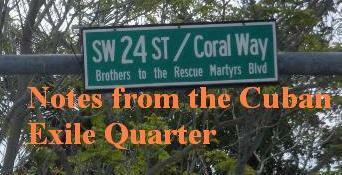 Would taking Cuba off the list and opening travel between the two countries while the outlaw regime of the Castro brothers continues to run the island be a wise idea?